A follower and a fine mark. Herbert Rapiport played for Fitzroy 1884-92, 1896, he was recruited from the Normanby club which was the forerunner of Fitzroy. 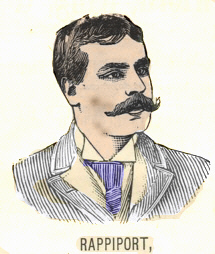 In 1896 Bert was the leading goal scorer for the Roys with 12 goals. Rappiport was a regular in the Fitzroy Football Club team, perhaps the Blues were a player short for this exhibition game. A person named H. Rapiport (slightly different spelling) served on the Fitzroy Football Club committee in 1889 and 1890. Carlton played North Park on the Friendly Societies' Ground. Carlton had named 21 players in the squad but at least four of these were unable play. The Age on Wednesday 12th. reported that Rappiport and McRaile from Fitzroy, Peters from Williamstown and White from Essendon took their places. A visiting professional Amercian baseball squad was touring and promoting the game. Players from the Chicago club and a mixed squad calling themselves the All America team were in Melbourne. The Americans and their manager Mr. A. G. Spalding of the sporting goods fame, were very interested in seeing an Australian Football match. Carlton and St.Kilda had played a shortened demonstration game for them at the St.Kilda ground on 31 December 1888. This time Carlton would play Port Melbourne and the match ended in a draw. Rappiport scored one of the Blues three goals. Mr. Spalding and his players were very impressed with the Australian game. They felt that the British Association and Rugby games were not suitable for American tastes, and he said he would endeavor to have the game introduced to the US. This is the only time the Blueseum has come across Rappiport's name connected with a Carlton side, so far he does not appear in any other Carlton teams. The Age's report of the exhibition game said that Rappiport was helping out the Blues. Rappiport is named in the Fitzroy team to play Carlton on the Brunswick Street ground. 1891 Rappiport played for Victoria against South Australia on the Adelaide Oval, June 13 and June 16. He was a follower for the Vics who won the first match 7.8 - 5.9 and lost the second match 4.7 - 5.6. Rappiport is named in Fitzroy 's 22 man squad to play Richmond on the Brunswick Street ground. Passed away suddenly in 1913. He was a prominent member of the North Shore Football Club in Sydney for several years prior to his death. Page last modified on Thursday 23 of July, 2015 10:47:22 AEST by blueycarlton.